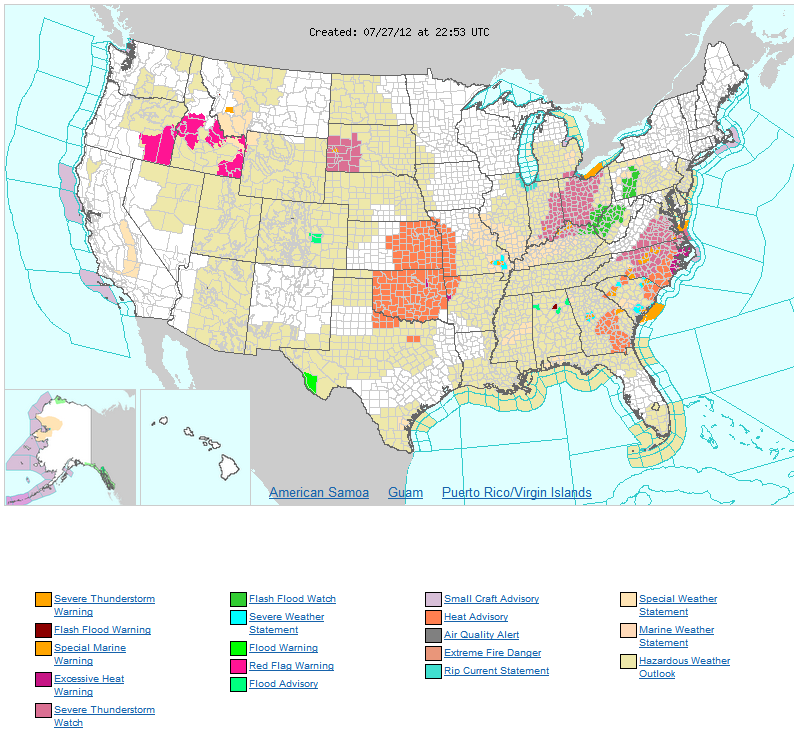 A huge outbreak of severe thunderstorms hit United States on Thursday, July 26, 2012 causing damage in fifteen states and knocking out power to over 250,000 customers. Severe thunderstorm warnings were in effect for 132 counties in 15 states along but it was not as nearly as violent as the June 29 - 30 Mid-Atlantic and Midwest derecho. It can be, however, classifed as a derecho, since it met the main criteria, as defined by NOAA’s SPC. Three people were reportedly killed. 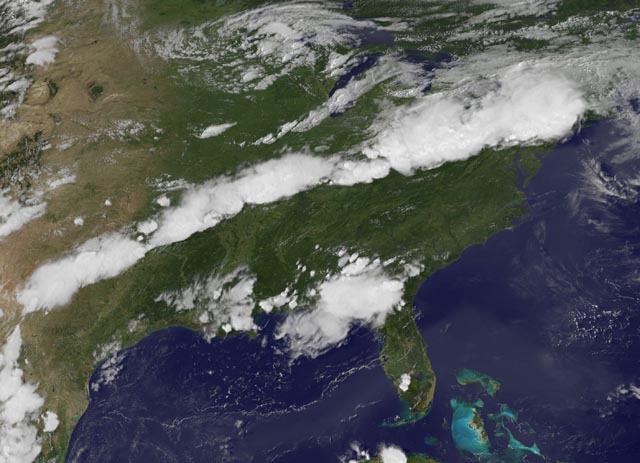 The severe storms covered an unusually large area, erupting along a 1,500-mile long swath of the country from Texas to Connecticut. Tornadoes touched down in the Pennsylvania towns of Coudersport and Montrose on Thursday. The one in Coudersport was rated an EF-1 with a maximum wind speed of 90 mph, and the Montrose one was an EF-0 with maximum winds of 80 mph, the National Weather Service said. NWS also reported that damage in Elmira, New York, was caused by an EF-1 tornado with estimated maximum wind speeds as high as 110 mph. The intensity of the thunderstorms was increased by a very hot and moist air mass; temperatures in the mid to upper 90s were common across the region on Thursday. A number of record highs for the date were set, including a 98° reading at Washington D.C.’s Dulles Airport. The threat of severe weather continues for Friday afternoon over portions of the Ohio Valley and mid-Atlantic, as NOAA’s Storm Prediction Center has placed these regions in their “Slight Risk” area for severe thunderstorms. Storm from June 29, 2012 was one of the most destructive and deadly severe thunderstorm complexes in North American history. It killed 22 people, knocked out power to at least 3.7 million customers, and did hundreds of millions in damage. effective this Friday night and Saturday morning from 7:15 pm until 3:00 am edt. EFFECTIVE THIS FRIDAY AFTERNOON FROM 4:25 PM UNTIL MIDNIGHT MDT. mph, and dangerous lightning are possible in these areas. of rapid city South Dakota. steep low to midlevel lapse rates and a deeply mixed boundary layer. 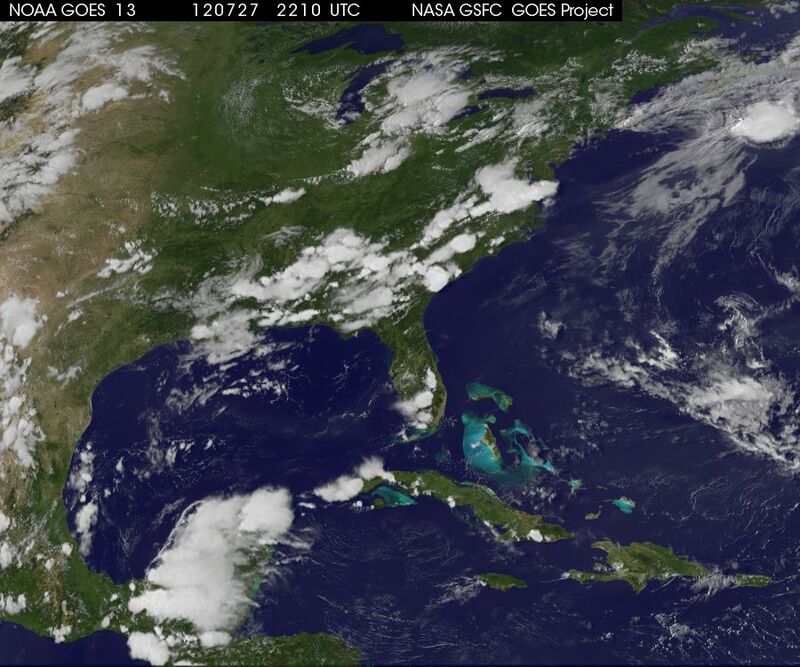 ...effective this friday afternoon and evening from 2:45 pm until 11:00 pm edt.